Doctor can you save my tooth? There are times that replacing a compromised tooth (e.g. 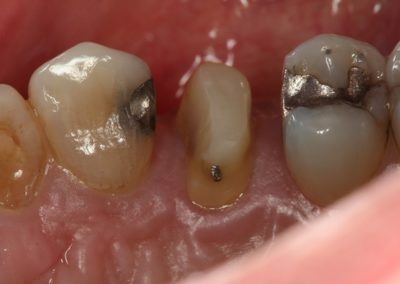 large cavity that goes way below the gum, or a badly broken tooth, etc) with a dental implant is a reasonable approach and is a more predicable treatment. 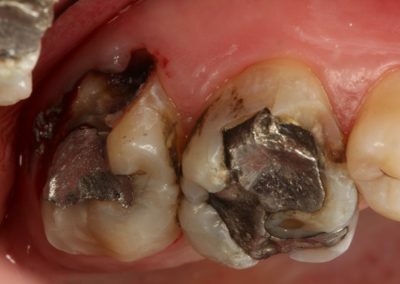 However, there are times when with adequate knowledge and skills a even a severely compromised tooth can be restored fairly predictably and with at a reasonable cost. 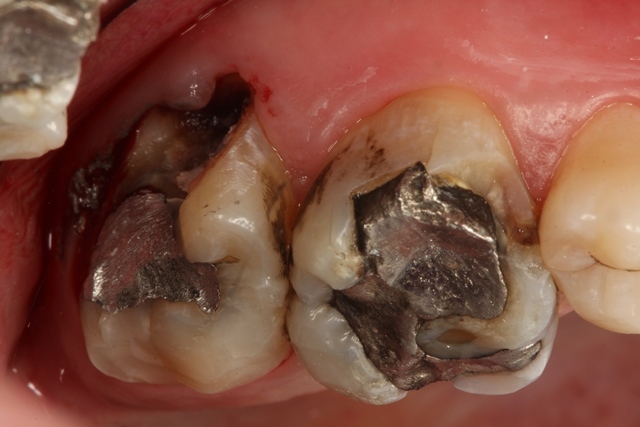 This is not the same as a sloppy patchwork to mask the problem and leave it to flare up at a later time, but to restore the tooth ideally and with well over 10 years survival in the mouth. I would like to share two cases where patients were told to have their teeth extracted because they could not be saved. 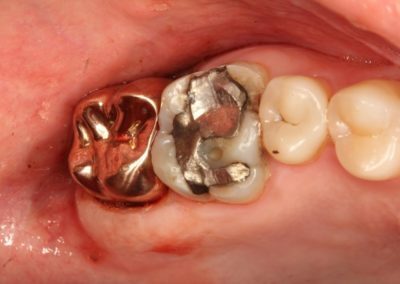 This patient was referred to me for extraction of a broken tooth (First Premolar, #12 because it was broken, had cavity and there was so little tooth structure left above the gum to re-built it. Patient could not afford the cost of a dental implant and was going to have a 3 unit bridge make by his general dentist. I did not agree with my colleague about pulling out the tooth, but I did not have much to say. It happened that the dentist retired and she came to see me to have her tooth pulled. This time I had a chance to share my opinion with her and encourage her to let me save the tooth for half of the cost of a 3 unit bridge instead of extracting it and having a 3 unit bridge fabricated. She was excited to hear that the tooth could be saved and asked me to do what I thought was necessary to save it. 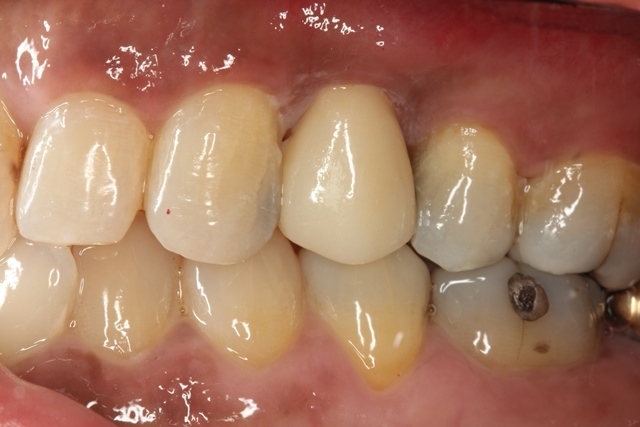 In order to provide adequate tooth structure I first performed a minor periodontal surgery called Crown Lengthening, waited 5 weeks for the gum to heal, rebuilt the missing tooth structure and then placed a porcelain crown to protect the foundation I had meticulously prepared. To my surprise she did not need any root canal treatment either. This case was completed nearly two years ago and I am confident at least 10-15 years longevity can be expected without any complications. She may have spent a little more money to complete a few dental procedures by a specialist, but it was certainly less expensive that having it pulled and replaced by a dental implant or a 3 unit bridge. Besides, keeping her own tooth was priceless. 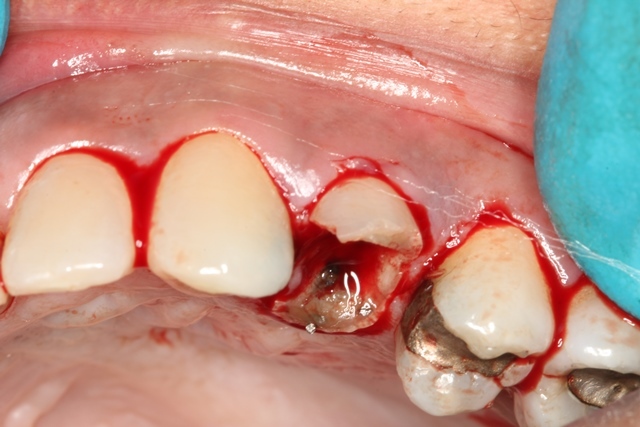 Tooth #12 was planed for extraction due to fracture and extensive tooth loss. Tooth #12 after CL and build up. 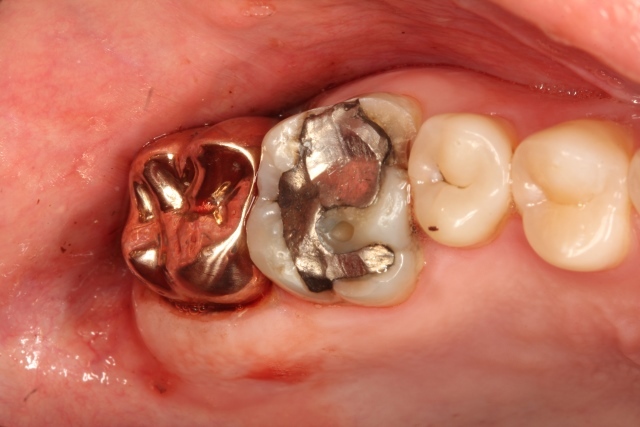 Crown Lengthening was performed, tooth build up was completed, gums healed adequately. tooth #12 restored with a porcelain Crown. This is a more recent patient in his late twenties, who came to my office for having a tooth ache and told me that a year ago, his general dentist had filled a cavity and had told him if the tooth becomes painful have it pulled because it could not be restored. In fact he came to my office believing he will have an extraction. 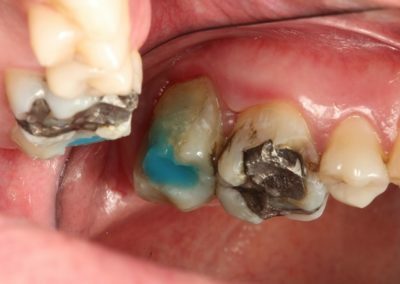 When I completed my examination I found out that there was still lots of tooth decay under the previous filling and even more extending under the gum. 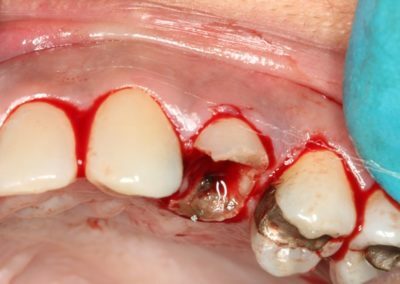 The tooth was fairly close to the wisdom tooth, the access to remove the decay was rather hard, there was limited mouth opening and extensive decay below the gum. 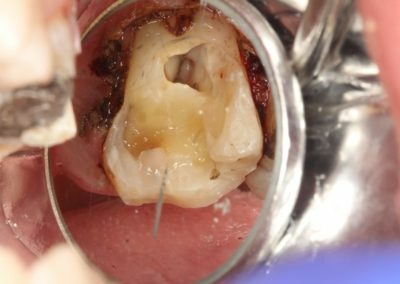 I was not sure if I could save the tooth, which was directly depended on me being able to fully excavate the caries, but I explained to him what I could do and encouraged him to let me try to save it. Actually, I had my Extraction Kit ready too; not knowing what to expect but determined to help him save his tooth. I would have certainly charged more money if I had simply extracted the tooth and replaced it with a dental implant, but I was not convinced that was the best course of action. I told him if at this young age you start loosing your teeth, by the time you get to your fifties you won’t have many teeth left. Before sending the patient to a root canal specialist, I needed to make sure the tooth is restorable. It is a financial burden to have a root canal treatment completed and then have the tooth pulled. 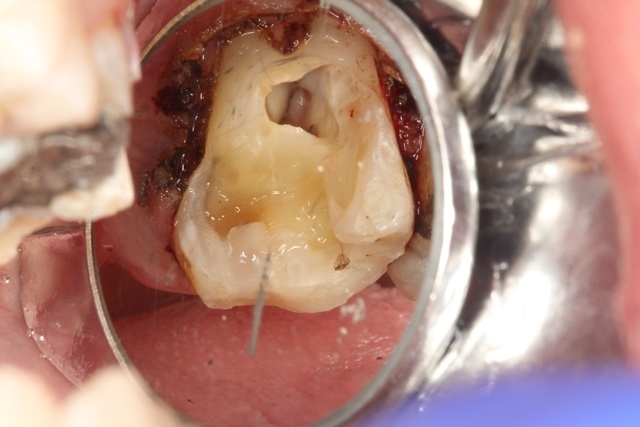 I excavated the decay which was fairly deep, but in order to successfully remove the cavity I had to perform Crown Lengthening which is a minor periodontal surgery, then i had to make a provisonal crown to protect the tooth and send the patient to a root canal specialist to complete the root canal. After the period of waiting, for the gums to heal, I filled down the tooth and capped it with a cast gold crown. I assured my patient there won’t be any reason to worry about the tooth nor the crown, as long as he manages to keep it clean by daily brushing and flossing.It took multiple steps and visits, but the outcome was excellent and I am confident it will last a good number of years (10-15 years or more). At this point I know I can save this tooth, so I prepare it for root canal treatment. Tooth #2 after Crown Lengthening and Build Up is complete. Gum is healed adequately and tooth is ready to be filled down for a Crown. 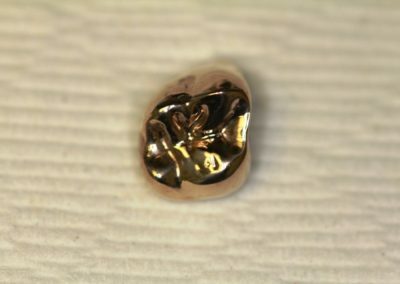 tooth #2 successfully restored with a Gold Crown. Do Not be fooled by its unattractive yellow color! It cost more than a white crown. 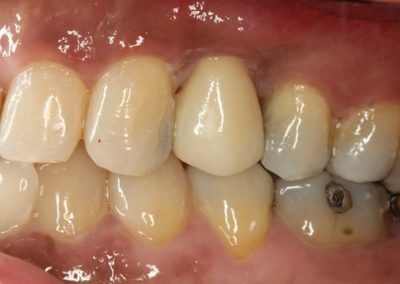 These examples clearly demonstrate how meticulous attention to details by a skilled prosthodontist can save you your teeth.